(TORONTO, ONT.) 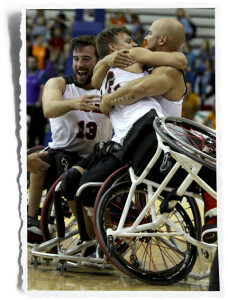 The score clock hadn’t quite run out when the standing ovation for the Canadian Parapan Am Men’s Wheelchair Basketball Team started in their semifinal match against Brazil. Wearing a grin from ear-to-ear, veteran player Chad Jassman, of Calgary, Alta., crossed half and held onto the ball as everyone waited for the final buzzer, but the celebrations had already erupted. 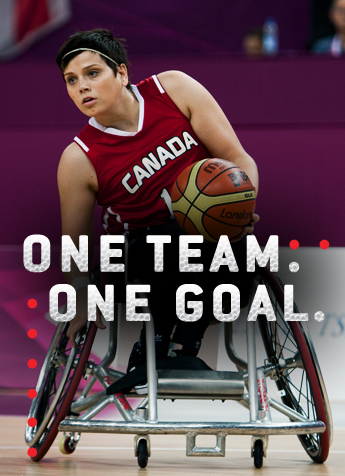 With a 70-54 semifinal victory over Brazil, Canada and their fans were ecstatic that the team remained undefeated, and that they would be moving on to face the USA in Saturday’s gold medal final, but most importantly that Canada earned themselves a spot to compete in the Rio 2016 Paralympic Games. “I’m feeling amazing right now. It’s amazing to get the opportunity now to go to the Paralympics, it’ll be my first one and just to play on this stage and then an even bigger stage in Rio. We’re going to be preparing very hard so we’ll be ready to go,” said 17-year-old Liam Hickey, of St. John’s N.L., the youngest player on team Canada. Brazil utilized their height to their advantage early in the match by penetrating Canada’s defence and parking their big players under the rim where they buried 10 of their 18 first quarter points from the paint. They went on a six-point run to end the opening frame with a 18-15 lead. Unfazed by the early deficit, Canada calmly turned to its leadership group to help turn the tide. Like they have been doing to opponents all tournament long, David Eng of Montreal, Que., and Nik Goncin, of Regina, Sask., went on the attack. Overwhelming his initial defender with game-breaking speed and then getting a second Brazilian to bite on a pair of rapid head fakes executed in combination with an agile twist one way and spin the other, Goncin pulled two defenders toward him before dishing the ball to a wide open Eng. Uncontested and just inside the free-throw line, Canada’s co-captain took his time to kiss the ball off the backboard and into the net. “I knew this was really important for us. It was our way to go to Rio and we needed this game to be able to qualify. So I really had to calm myself and stay in the moment every single possession,” said Eng. “I’ve got awesome, great teammates that were able to feed me the ball and pass the ball and attract the defense to create space for me to be able to go inside the paint. The points were just two of a game-high 28 for Eng, and the assist was just one of a game-high seven for Goncin who also led the floor with 17 rebounds, but they allowed Canada to both take back the lead (23-22) and establish some of the swagger that would be on display for the remainder of the match. With the monstrous performance, Eng heads into the final tops in overall scoring averaging 17.8 points per game, while Goncin sits third in tournament scoring with 16.6 points per game and is second in rebounding with 10.6 boards per game. “The Brazilians are going to come out with a lot of energy every game and they’re going to hit shots and do what they do and try to get inside. So you just kind of weather that storm and then they’re emotions kind of dip, and you just keep playing and continue to make them work. That’s what this team is all about is making the other team work as hard as they have to,” said Team Canada co-captain Bo Hedges. The gold medal game between Canada and the USA will be seen live on CBC TV across the country Saturday August 15, starting at 11am ET. It will be a battle of titans with Canada and the USA both dominating their respective opponents throughout the tournament. 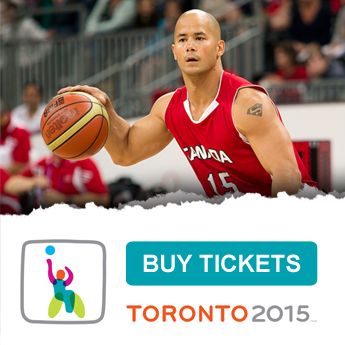 Canada’s 387 points for is tops in the competition, while the USA has allowed the fewest points against with 185. The final will also feature two of the tournaments top playmakers. Hedges is amongst the leaders with 22 assists accumulated for Canada, while the USA’s Steve Serio leads the category with 27.